Quietly, in the midst of the house cleaning and repairs for my daughter Kelly's graduation party, I have been stockpiling supplies in my office. For, today, I am under siege. Or, to put it another way, today I'm attempting to read all the Siege issues published by Marvel Comics in recent months. I've raised the drawbridge, bolted the door, and settled in for the long haul. Oh, sure, there's always the possibility someone will try to storm my office from the outside. They do so at their peril as I have prepared cauldrons filled with burning copies of Blackest Night and other DC Universe events. It won't be pretty. 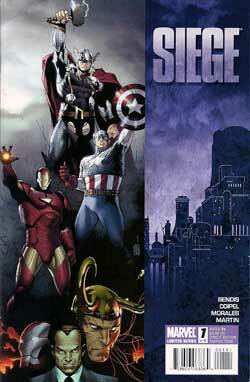 Siege [four issues; $3.99] is the climax of the "Dark Reign" of Norman Osborn. If you've been following what's going on in the Marvel Universe, you know that Norman Osborn took advantage of unbelievable government insanity and the suddenly-not-so-secret Skrull invasion to position himself as America's "top cop." Which hasn't gone well for the actual heroes or, for that matter, the bad guys he's been passing off as heroes. Norman sees Thor, recently returned to Earth, and the fabled city of Asgard, currently floating over a portion of Oklahoma, as the major threats to his plans. He orchestrates a lethal disaster, pins it on the Asgardian Volstagg, and uses this as his excuse to launch an attack on Asgard and its inhabitants. Norman is crazier than a soup sandwich. I'm reading Siege because I figured it would be a good way to catch up on the Marvel Universe before The Heroic Age begins. I suspect I'm like many comics readers in hoping this new chapter will be more optimistic, more positive than previous Marvel Universe-spanning events. Which is not to say I haven't enjoyed a lot of what has happened in recent years. I don't know if Marvel just plans their events better than DC, or if the Marvel writers and editors are just better at thinking on their feet and making certain their developments fit together in a more seamless manner. Whichever it is, I've enjoyed these Marvel "events" far more than the equivalent DC ones. A small part of me thought the idea of Norman Osborn rising to such incredible power and authority was interesting. The rest of me couldn't believe it. President Obama is too smart to allow such a development in any universe. Even President Bush would not have gone for it. Okay, maybe Cheney and Rumsfield would have been good with it, but I can't imagine any arguments supporting a psychotic super-villain for the position as leader of America's super-powered forces would have carried the day. Whatever good stories came out of this development - there were more than a few - they were undone by my refusal to believe in the basic premise. So, if nothing else, I welcome Siege as an ending to a storyline that defies my acceptance. It's written by Brian Michael Bendis, one of my favorite Marvel writers of all time. It's drawn by Olivier Coipel and Mark Morales, as dynamic and sure an artistic team as any today. It's edited by Tom Brevoort, the absolute best editor in comics today. It has great moments of heroes stepping up to the plate and doing what's right and necessary without fear and without apologies and, here's a nice switch, finally working with our elected government to do so. There are a few nice moments with individual characters, though I would have liked more, and a sense that, at long last, things have changed for the better in this most vibrant of super-hero universes. Do I have problems with Siege? Of course, I do. These stem from my dislike of the Hollywood mentality that has infected so many of our comics writers. There are enormous body counts that don't begin to convey the actual tragedy of those losses. There is over-the-top gore for shock effect. On my angrier days, I wonder if comics might not benefit from a five-year moratorium on writers who write for Hollywood. On most days, I just wish comics writers could understand they are better than Hollywood, that Hollywood is feeding from their table and not the other way around. I want to see more personal stories from writers like Bendis and much less of this "big event" stuff. I'd much rather listen to readers talking in excited tones about Captain America or Spider-Man or Thor than about "Civil War" or "Secret Invasion" or "Dark Reign." I want, at least, a partial return to smaller stories that speak large of the human condition. This is not a review of Siege #1-4 as I would've liked them, but of how they actually were. They come off pretty well on that basis, earning an impressive four out of five Tonys. I'll be reading the rest of the Siege comic books for near-future TOTs, but I'll only be reviewing those issues that are really good or really bad, or those in between issues that inspire me to comment on them. Look for those reviews soon. Preparing for Kelly's party has me behind schedule on several fronts, necessitating a brief hiatus for TOT. As always, I thank you for spending part of your day with me. I'll be back on Monday, June 28, with more stuff.